One of the most popular seminars that I present at RV shows, conventions and rallies is entitled, “Optimizing the 12-volt Battery System.” It’s been a topic that undergoes frequent updating as new technology comes to the fore or as new problems arise within the DC systems found on today’s recreation vehicles. Clearly 80-90% of the questions sent to the RV Doctor Column are electrical in nature, so it’s no surprise one of the biggest challenges facing RVers today is maintaining a healthy battery system; what I call, battery optimization. In my “Optimizing….” Seminar, I advocate having the ability to carry as much current-carrying capacity that space permits and that your wallet can endure. One can never have too much battery current on hand to power the DC components found in the modern RV. And there are many! Typically, all lamps, fans, slideouts, water pump, leveling jacks and electronic ignition appliances, among other devices, rely heavily on a hefty 12-volt battery system in order to operate at their optimum. A healthy battery system is a mandate in most applications, so having as many batteries as possible should be a good thing, right? What some RVers often forget, is that adding more batteries to become more self-sufficient (especially when dry camping), is only half of the equation. Yeah, it’s great to be able to have lots of amps at your beck and call, but it’s just as important, if not more so, to be able to properly replenish that battery bank in order to take advantage of having those extra amps available. And that’s the rub. Along with simply adding batteries to the bank, one must also consider how to be able to fully charge that larger depository without risking damage to the batteries. The more current you store, the more important it becomes having the proper charging methodology on hand to safely charge any battery bank. One way is to replace the stock engine alternator with one of a higher output capability to help charge the house batteries while driving down the road. The other is to ensure the inverter or converter is sized appropriately and designed properly to fully charge the battery system without an inherent danger of overcharging when connected to shore power. But the typical converter/charger installed by the coach manufacturer will not likely be able to properly charge the complete system in a timely fashion. 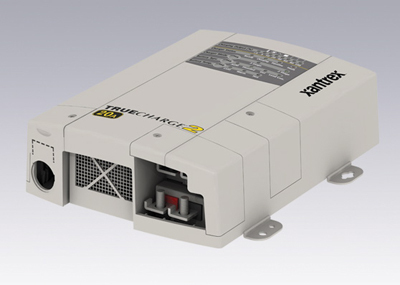 Because of the proliferation of 12-volt DC accoutrements, many converter/chargers are undersized for the task as they leave the factory, even before adding additional batteries to the equation. And that’s when I start seeing an increase in emails to the RV Doctor Column. Dear Gary, my furnace will not ignite but the fan comes on; my generator will crank, but not start; my slideout moves very slowly and stops before retracting all the way; my water pressure is too low at the lavatory faucets; my hydraulic jacks will not level the coach. These and a few hundred other symptoms can be caused by a faulty battery system; specifically, low voltage at the batteries. 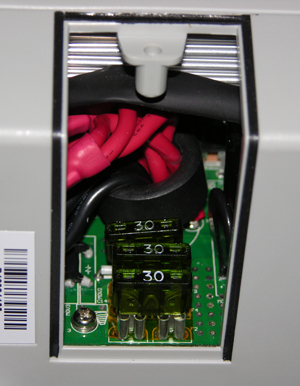 Many converter/chargers installed in some RVs seemingly are designed to never overcharge the batteries since that condition leads to a plethora of issues. That’s the good news. The bad news is that many of these same converter/chargers are not designed to be able to fully charge the batteries either; at least in a timely manner and some are simply not capable of fully charging a large battery bank efficiently at all. Some even have the predilection to overcharge the batteries. That said, most modern RV converter/chargers are typically great converters, simply poor battery chargers. Their main job is to convert 120-volt AC electricity into 12-volt DC electricity since most every convenience on a contemporary coach is powered or controlled by DC. And most do that gallantly depending on the type of converter. Their shortfall is clearly with the battery charging capability. It’s my opinion the committed RVer truly requires a dedicated battery charger; one designed with the health of the batteries in mind. Since no two RV battery systems are identical; varying loads, different types and number of batteries, length of conductors, etc., how can one be sure the batteries will be charged completely and effectively in the shortest amount of time? As I’ve often stated in my seminars, thank goodness for the aftermarket! Read on. The term “smart charger” has been around for a few years now, but what does that really mean? Do they embody some type of intelligence? Well, in a manner of speaking they do. 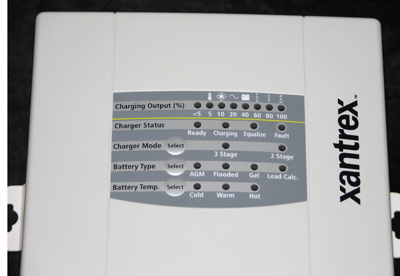 A true smart charger is controlled by an internal microprocessor, it has multiple stages of charging procedures, it can operate under varying AC input voltages, it employs temperature compensation and has safeguards against overcharging as an inherent characteristic. 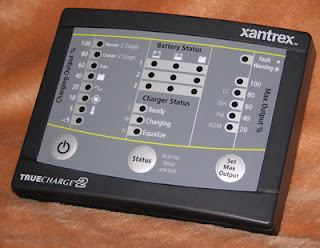 All this and more can be found in the serious RVer’s newest best friend, the Xantrex Truecharge2 battery charger. The Truecharge2 is the newest version in the Truecharge line. Available in 20, 40 and 60-amp outputs, the Truecharge2 just might be the answer to quite of few of those RV Doc questions. In fact, I know that to be true in many cases. Not only is the Truecharge2 processor-controlled and features either two or three-stage charging, it also contains battery charging algorhythms (customized charging procedures) for multiple battery types. Here’s the key difference between a mediocre charging/converter and a thoughtfully designed smart charger; the typical charging/converter has only one type of charging sequence (based on voltage and current flow), regardless of the “type” of battery it is charging. And please realize not all 12-volt batteries are created equal. In order to become optimized, the different types of batteries require varying levels of voltage and amperage delivered over specific time frames. In other words, a one-size-fits-all battery charger will result in a less-than-optimized DC power source. Thankfully, the Truecharge2 battery charger allows the user to choose the type of battery bank being charged. It is compatible with flooded, GEL, AGM and lead-calcium batteries. (There is also a “custom setting” for specially designed algorhythms programmed by Xantrex for specific applications). This assures the optimum amount of current, pushed by the correct amount of voltage over the proper amount of time (based on that battery’s current state of charge and temperature), is delivered to that bank. Bingo! Battery optimization! The charging sequence is designed specifically for that battery type. The fear of over-charging the battery bank is eliminated altogether. A fourth available process, Equalization, is applicable to liquid-filled batteries only (flooded lead-acid and lead-calcium). Another nice function of the Truecharge2 is the ability of the user to choose between three-stage charging and two-stage charging (eliminating the Float stage). During the Bulk stage, the charger delivers its maximum current output in a constant fashion; full amps flowing into the battery bank. All batteries store current, measured in amps. Once the battery voltage reaches a pre-set point (remember, it’s a different requirement for each of the battery types), it switches to the Absorption stage. In the Absorption stage, the Truecharge2 holds the voltage steady at a set rate as the current flow lessens. 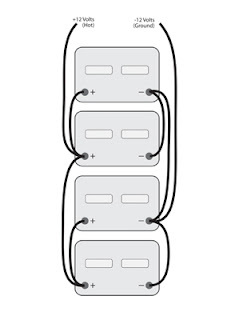 Once the battery reaches its gassing threshold, (again, a different voltage level for each type of battery), the charger switches to the Float stage. During the Float stage, the Truecharge2 delivers a lesser amount of voltage to maintain the battery bank in a charged condition until the bank voltage drops below 12.5 volts for about fifteen minutes. Then it awakens and enters the Bulk stage and the process continues. I’m often asked if it’s permissible to leave the RV plugged into shore power during lengthy periods of non-use. I usually warn against such a practice primarily because it’s likely the battery bank will be over-charged by a typically mediocre converter/charger at some point and literally boil the electrolyte out of the batteries. Over-charging a flooded, wet cell battery (lead-acid and lead-calcium) produces dangerous gasses containing hydrogen and oxygen. I’ve personally witnessed exploding batteries in the shop during an improper charging cycle; it ain’t pretty (see my sidebar note below). With the Truecharge2, the over-charging concern mentioned above is totally eliminated. Under normal circumstance (the absence of 12-volt DC anomalies), it is now possible to leave the RV plugged into shore power continuously, even without adult supervision. Here’s why, once the battery bank enters the Float stage and no 12-volt device is energized, it will stay in float for seven days or until the voltage falls below 12.5 volts for fifteen minutes. Assuming nothing is draining amperage out of the battery bank, after the seventh day, the Truecharge2 again begins its charging algorhythm anew, just to keep the batteries refreshed. Because of the integral design principles, the proper charging sequence remains in effect for as long as the Truecharge2 is powered by the 120-volt AC electrical supply. One of the advanced features of the Truecharge2 is the inclusion of proper charging sequences based on the temperature of the battery. 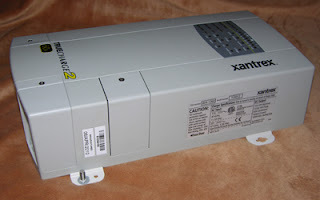 Though it is offered as an option, I highly recommend the installation of the Xantrex Battery Temperature Sensor (BTS). The importance of battery temperature is reinforced by virtually all battery experts even when measuring the Specific Gravity of each cell in a flooded battery. That’s why it is advisable to always use a temperature compensated hydrometer. So it is when charging a battery bank. · Cold - battery temperature below 41-degress F.
· Warm - battery temperature between 41 and 86-degrees F.
· Hot - battery temperature above 86-degrees F.
With multiple batteries in a single bank, always install the BTS to the battery that is typically the warmest. All batteries in the same bank will be charged according to the temperature of the warmest battery. 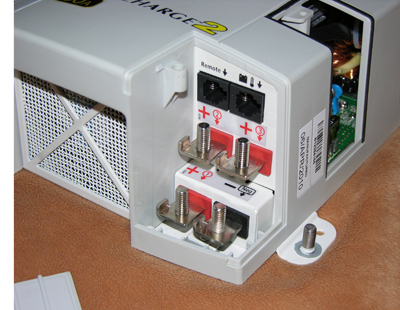 Long considered a design fault with the typical converter/charger is the fact that it can only charge one battery bank. Usually only the house batteries receive a positive charge when connected to shore power in the typical RV. In a motorhome application, the engine battery only receives a charge via the engine alternator when driving down the highway. Taking into consideration the normal current draw on batteries in a static situation (parasitic drains), the motorhome engine battery often goes dead during lengthy stays in one location. Not so with the Truecharge2. In fact, it is designed with three separate charging outputs. (The third output may be utilized for a dedicated generator-starting battery). Now, both (or all three) battery banks can be safely charged whenever 120-volts AC electricity is available. This eliminates the necessity of those dreaded “Emergency Start” solenoid switches found on some motorized RVs. I’ve been railing against them for decades. It is simply detrimental when two individually designed (drastically different) and totally separated battery banks are, all of a sudden, linked in parallel. With the push of a momentary switch, the two battery banks instantaneously become one big battery bank. The massive transfer of energy from the charged bank into the dead battery can damage internal plates, create excessive heat and cause accelerated sulfation in some batteries; none of which is a good thing (remember…the key word is optimization; that which is best!). Whenever energized, the Truecharge2 charges all battery banks at the same time, but the most-drained battery bank receives the biggest charge first. This is determined by the unit’s built-in battery qualification sequence. Whenever 120-volts AC first powers the Truecharge2, it goes through a complete battery evaluation to determine which of the batteries is most in need of replenishment. So, if an RVer stays in one campground for a long time, he can be assured the engine starting battery will be up to snuff and should never have to be interconnected with the house battery ever again. The battery qualification sequence can be manually induced at any time, by the way, by simply removing the Truecharge2 from the AC source until all the indicators on the unit have gone dark. Then simply plug it back in. Each charging circuit is protected by a separate 30-amp fuse inside the Truecharge2. Every RVer who has ever experienced less-than-stellar performances from the stock converter/charger should seriously consider adding the Truecharge2 to the 12-volt DC battery systems. This will help optimize the systems by allowing the converter to simply convert and the Truecharge2 to be the dedicated battery charger for all the batteries on the RV. I’ve installed the Truecharge2, complete with its comprehensive remote panel, in a motorhome and will be evaluating its performance over the course of a full RVing season. I’ll be posting updates as well as installation photos in the coming weeks and months as a follow-up to this RV Doctor Product Spotlight, so stay tuned! And remember, RVing is more than a hobby, it’s a lifestyle! The danger of battery explosions is very real concerning flooded lead-acid batteries. I tell this true story to my RV students to drive home the importance of practicing correct safety precautions while working on or charging RV batteries. I was a working as a flat rate service technician at a large dealership that sold a very nice, elegant motorhome line. One of my shopmates was in the process of (incorrectly) charging a big 8D battery located in a side compartment of the motorhome. The compartment door was hinged on top. He had it flipped up and latched with two latches. The 8D battery was in a convenient slideout tray. Larry had the tray halfway slid out, battery caps off the cells and a healthy dose of current being pumped into it. Actually too much current as the battery was definitely gassing as it charged. Unfortunately, he had only latched one of the two latches and when he accidentally bumped that compartment door…you see it coming right? The aluminum-bottomed door fell across the two terminals on the battery and that big 8D battery literally exploded, spraying Larry and everything nearby with sulphuric acid. Thankfully he did not get acid in his eyes, but we never did find the majority of his right thumb. Safety is paramount when working on or near RV batteries! Never compromise the safety factor! ‘Nuff said!